Dubrovnik is a historic city on the Adriatic Sea coast in the extreme south of Croatia, positioned at the terminal end of the Isthmus of Dubrovnik. It is one of the most prominent tourist destinations on the Adriatic, a seaport and the centre of Dubrovnik-Neretva county. Its population was 43,770 in 2001 down from 49,728 in 1991. In the 2001 census, 88.39% of its citizens declared themselves as Croats. Since 1979, the historic centre of Dubrovnik has been included in the UNESCO list of World Heritage Sites. Pressured by hostile tribes from the interior, the Dubrons asked the Republic to grant them refuge inside the walls and they obtained the right of asylum and the residence in a marginal quarter of the city. 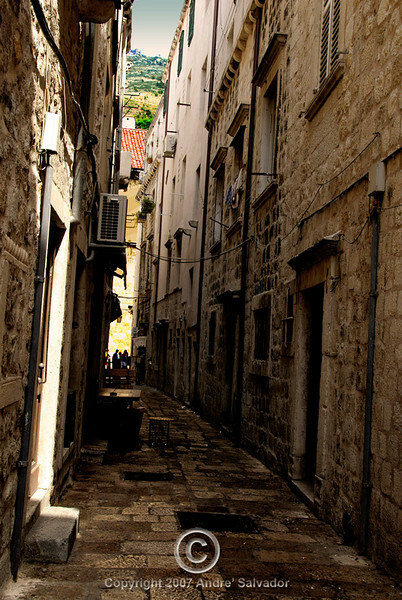 Among themselves, the refugees named the quarter after their native-born village: Dubrovnik. These photographs were taken in the summer of 2007. Information taken from Wikipedia. Where in the world is DUBROVNIK, CROATIA? Narrow and dark but stil picturesque. My one regret is I cannot stay longer to take better pictures of the side streets.